The old saying of 'expect nothing, and you'll be pleasantly surprised. Expect to be wowed, and you will be underwealmed', is very true at Virgin Atlantic. Virgin Atlantic is a very proficient airline, but if you believe the advertising, it is the bees knees and the best airline in the world. It's not, and quite frankly it's a bit tired and haggard around the edges, but it does the job, and it has little touches that keep it far from boring. Recognising that there are many passengers who want paid Virgin Atlantic Clubhouse access, Virgin have now introduced the Virgin Atlantic Guest List, which is in effect a day pass to the London Heathrow Virgin Clubhouse, plus the London Gatwick, Boston, New York (both Newark and JFK), San Francisco and Washington Clubhouses. Daypasses are never sold to the Tokyo or Hong Kong Virgin Clubhouse - you're simply out of luck at these locations. The Virgin Atlantic Clubhouse cost is no less than 240 pounds – as a basic starting price – and that's not a typo. It really is two hundred and forty pounds, for three hours of access, with an economy ticket. For £240 (rising to £1,200 for six people with a car at both ends of the journey) you also get a few other bits of the Virgin Upper Class ground treatment, like the free taxi to the airport in a chauffeur driven car, and an Upper Class bag tag to put on your bag. But make no mistake – that at best is £50 worth. The rest of the cost is purely about buying access to the Virgin Atlantic clubhouse. For 240 quid, it might be better to splurge on booking your own cab, and buy one of the other payin lounges at Terminal 5, and spend the rest on Premium Economy. Mind you with a full upgrade from economy to Upper only costing £595 at checkin (to some destinations), which does give access to the Virgin Clubhouse, even that might be better value. Of course, if (and only if) you have booked a holiday directwith Virgin Holidays, and your flight leaves from London Heathrow, you can book access to the clubhouse there for £60. 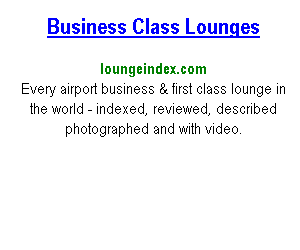 One of the common questions is "How do I get an upgrade on Virgin Atlantic to Business or First class?". Alas, getting upgraded to business class on Virgin really isn't that easy. The airline has the Western, rather than American, model for upgrades longhaul. Which is to say you'll only get an upgrade if your paid for class is full, and then upgrades are processed accordingly to a pecking order of elite frequent flyer status. You are very unlikely to ever get an upgrade unless you are at least a Gold flying club member. To start with, make sure you are a frequent flyer, and you do fly frequently: after all, if Virgin are going to upgrade anyone, they will upgrade those passengers who fly with them pretty regularly, and hence will enjoy the upgrade enough to put more business their way. Then if the flight is full in economy, and someone needs to be moved up, the check in staff will first look at Gold members, and then Silver level. Virgin also pay attention to both Singapore Airlines and Velocity gold status, but you will be lower down the pecking order. Another thing that Virgin look at is how much you paid for your ticket: it's much more likely to happen with a full fare ticket (although occasionally you can get lucky with a discounted economy ticket). Virgin Atlantic are very good about publishing their upgrade policy before checking: indeed, it is hard to avoid to 'U' question, and you'll be asked many times if you want to hand over cash for it. 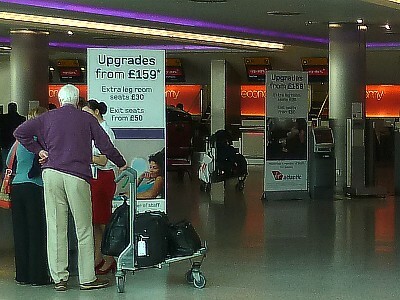 There are huge signs advertising upgrades, extra legroom seats, and emergency exit seats at checkin. Extra Legroom seats generally represent a poor deal - you'll only get a few more inches of legroom, and note that this is not an upgrade to Premium Economy. They come in at around £30. Exit row seats are however a much better deal. You will get acres of legroom at the front of the cabin, but it is hard to get these: they are generally taken up Flying Club Gold members. If you can get one, they are £50. Then you come onto real upgrades. The lowest advertised price is £159, but again, beware this isn't an upgrade to Business Class. One way, from Economy to Premium Economy is £159 for the shortest of flights (to Dubai), but a whopping £729 to Australia. These upgrades just get you the seat, and a bit of extra luggage. For an upgrade to Upper Class, which also includes the Clubhouse, you'll be on for at least £595. Mind you, with a daypass to the Clubhouse costing £240, you might actually think this isn't such a bad deal. As always, these prices can change - and are dependent on there actually being space in the cabin you want to upgrade to. Quite often, Premium Economy is sold out. Virgin Australia the Australian low cost network. Virgin Atlantic has links with Virgin Australia (Airline code VA, previously called Virgin Blue), which is an Australian low-cost airline founded by the Virgin Group. It is based in Brisbane. There is also a long haul version of Virgin Australia (called V-Australia with the airline code ZG). Initially it could not be called Virgin, because Singapore Airlines (through their stake in Virgin Atlantic) have control over the use of the 'Virgin' name on International air routes. But this was relaxed when Singapore sold off Virgin Atlantic. There is a fleet of four Boeing 777-300 ER planes. They seat 33 in Business, 40 in PE, and 288 in economy. All classes have an AVOD in Flight entertainment system called RED on every seat. V Australia is just like Virgin Atlantic, in that it offers a 3-class service: Business Class, Premium Economy and Economy. Business class has a 2-3-2 configuration with 6'2" fully flat beds, and a pitch of 77". Premium Economy has a 2-4-2 configuration with a 38" seat pitch, 20" seat width and a 9" seat recline. The seatback TV monitor is 10.6". Economy class has a 3-3-3 configuration, a 32" seat pitch, 18.8" seat width and seat recline up to 6". There is a 9 inch touchscreen PTV. Virgin Australia initially set up the airline to operate up to 7 flights a week from Sydney to Los Angeles International Airport (LAX), but had to change the name. There are now also flights to Nadi, and Phuket, from the three main Australian airports of Sydney, Brisbane, and Melbourne. Read more with a Virgin Australia Review. News: The Virgin Atlantic website has at last been updated from web 1.0. No longer are you resticted to a tiny 640x480 postage stamp window - alas, some of the older information pages haven't been updated, and you can see how geriatric the site once was. The Virgin Atlantic website looks amazing, but once you get past all the fancy graphics, it's just a standard airline website.